When my Grandma passed away last year I sat down to write. I needed to articulate what I was never able to say while she was alive. Through the process of writing I felt a deep sense of connection to her, exploring her life and our relationship through our shared interest in sewing. I am thoroughly honoured to have the essay featured in the March issue of Seamwork magazine. In the essay I touch on generational shifts, female identity, the value of making, and the gentle power of commitment I have found in my Grandma’s approach to sewing. As the year comes to a close, I like to stop for a moment and reflect. After all the busy merriment of Christmas, the approaching New Year represents a clean space of new beginnings. I tend to feel overwhelmed and out of balance after Christmas. The best antidote, I find, is to realign myself to what truly matters to me. You may feel the same. Reflecting over what actually felt good to you in the past year is a fruitful place to start, instead of jumping straight into grand schemes and lofty New Year’s resolutions. Try these questions to help you see what truly mattered to you in 2016 and get you ready and excited for 2017. You can write them out, mull them over or talk them through with a friend. Don’t overthink, though. You want to listen out for that tiny whisper of unexpected honest feeling. I hope 2017 will bring you peace and joy! 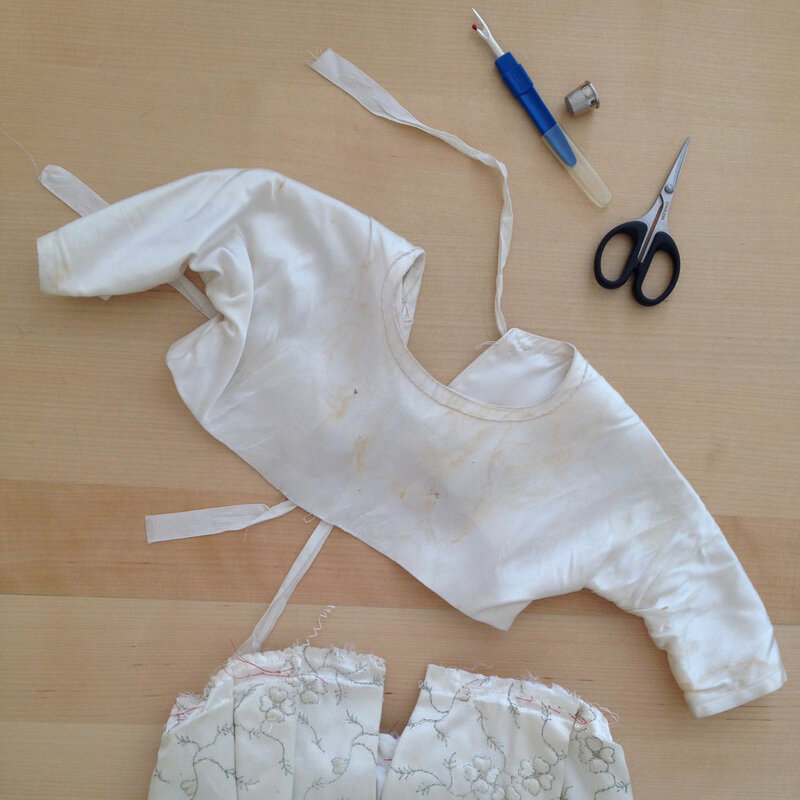 Mending something old feels different from mending something new. I unpicked stitches that were once sewn by my friend’s grandfather long before either of us were ever thought of. 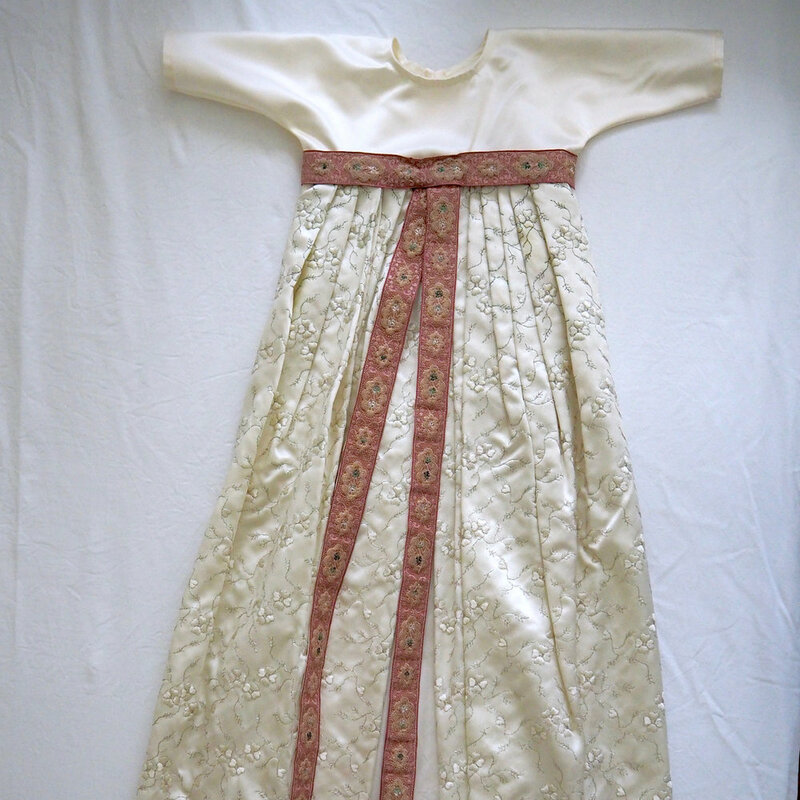 Now, this Christening gown is ready for the latest addition to their family: a baby boy and the third generation to be swept into its folds. The gown has served its time. It is itself a token of time, stained with babies’ drool and wrinkled with wear. Babies who have now grown into adults, parents and grandparents. It has that faint smell of old, evoking memories of blurry black and white photographs, fur coats and wide-brimmed hats stored and forgotten under a film of dust in some dark attic. It has the glamorous feel of a wedding dress, heavy with luxurious folds of fabric. My friend’s grandfather was a dressmaker. He worked for a time at the national theatre, I think. The imagery of elegant costumes and high drama seems fitting for a garment that has as its sole purpose to celebrate new life. I unpicked the bodice, traced it to make a pattern and sewed on a new one. It feels like I am continuing a line of history. History. I am putting my mark on its story. Mending it feels more special, somehow, than patching a pair of jeans. Why, though? Because with this gown the table is turned. Unlike most of the clothes that pass through our lives, this gown may still be hanging in the deep depths of some wardrobe when we ourselves have grown wrinkly, old and worn. It is a reminder that we are temporary beings. Will the stitches I sew survive me? They may do. This gown may well outlive me. It provides some perspective to the hectic rush of modern life. No, it says, you are not at the peak of history. Yes, it says, it will continue from here. This gown lives a very slow life, briefly saluting the generations that pass through it. Slow, slow fashion. May it live on to celebrate many more!